From left, social worker Kelly Haldaman, Matheny student Katherine Gaudio and volunteer Uma Patla. 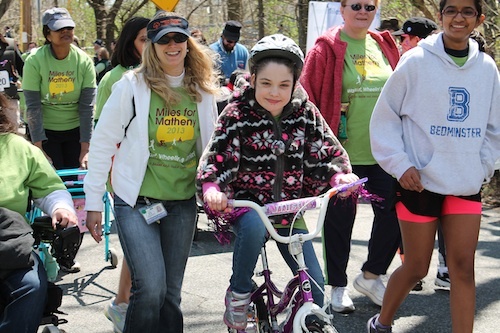 After last year’s rainy weather, the sunny skies were a welcome sight as participants, volunteers and spectators congregated in downtown Peapack for the 16th annual Miles for Matheny, our annual fundraiser and community event, held Sunday, April 21. Occurring less than a week after the tragic events of the Boston Marathon, there were also concerns about safety, but added police presence and other security measures put everyone at ease. In addition to the Wheelchair Walk and 5K, there were five different Cycling routes, a Kids Fun Run and The Friends of Matheny’s “Breakfast of Champions,” followed by luncheon refreshments in the park. All funds raised at Miles for Matheny will help support the Matheny Center of Medicine and Dentistry, which provides medical, dental and therapy care to Matheny’s inpatients and people with disabilities in communities throughout New Jersey. Major sponsors were: the Poses Family Foundation, title sponsor; Partlow Insurance Company; Peapack-Gladstone Bank; Porzio Bromberg & Newman, P.C. ; Affinity Federal Credit Union; and WCBS-TV and WCBS Newsradio 880. This entry was posted in Uncategorized and tagged Alex Denis, Miles for Matheny. Bookmark the permalink.